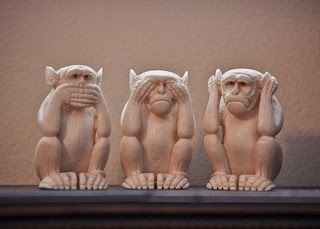 Experience: The Blog: What if Everything You Know About Social Media Marketing is Wrong? Augies, this post makes very important points and should be a wake up call. 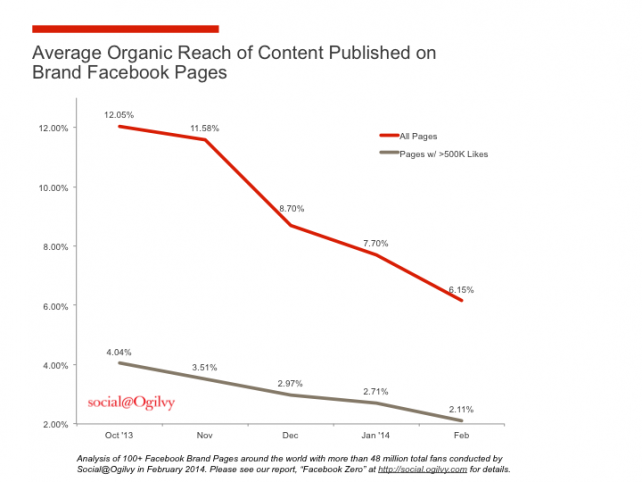 The decline of organic reach on Facebook is also related to FB changing its business model to favor paid advertising as the preferred way for brands to get reach. For some time now FB has been tweaking EdgeRank to reduce organic reach in order to get brands to purchase advertising. This is one of the most down to earth blogs on social media I've read. Everyone is in a social media frenzy but few are actually looking at the ROI. Anyone being pitched by of one of those social media gurus out there should ask the 'guru' one simple question: How much of an increase in sales can I expect? If a straight answer is provided, then the guru may well be worth hiring. Otherwise, social media campaign cash should be invested in more tried and trusted methods of marketing - such as, and as you mention, newsletters. I'll be recommending your blog to a senior manager in a major multinational I know - I suspect he'll find it extremely interesting. Excellent points, as always, Augie. My take: Very little brand-related social media involves high quality / high value executions that create value for both the consumer and the brand. Your article speaks directly to the point that organizations must define goals based on business objectives, establish metrics to measure performance against those goals, have an iterative process to do more of what works & stop what doesn't - from the customer's perspective, not solely the brand's. Social media is not one-size-fits-all, and for some (many? most?) it does not make any sense, or at least lacks a compelling return on investment. That said, social media is a fundamentally different channel than traditional broadcast channels since it has the potential to be highly interactive. I see social media marketers making the same mistakes as the nearly universally loathed outbound telemarketers or direct response postal mail marketers - groups that generally did such a poor job trying to exploit interactive communications platforms (telephone and postal mail) with broadcast messages. While there is still a massive amount of spam email, some email marketers have discovered ways to effectively engage consumers and create value in the process. Here's to hoping some enlightened souls do the same with social media and avoid following down the path of the bad telemarketers and junk mailers that alienated so many consumers from even engaging with those channels. I think the wake up call is a positive thing. Brands need to turn the model upside down as the points you made support. 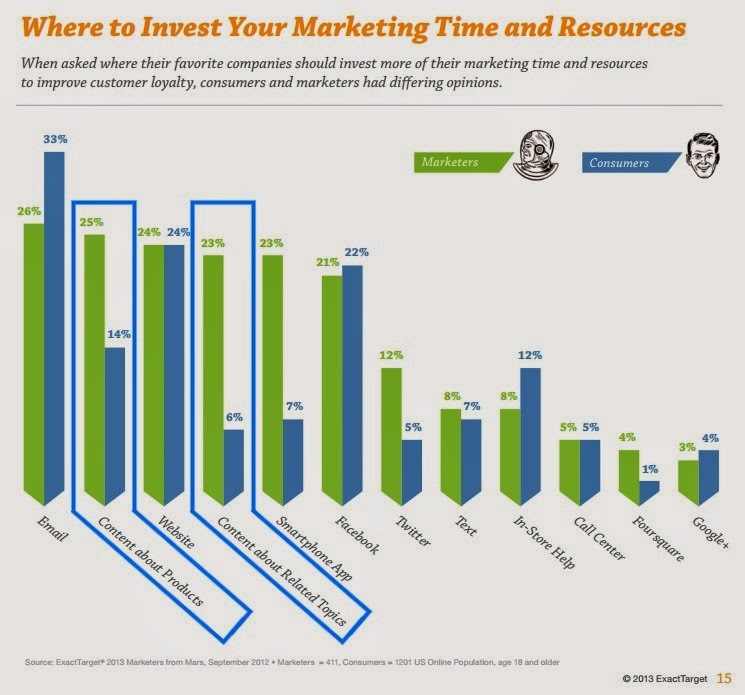 Marketers see life as a funnel in which you seek to convert a small percentage. Social is about reaching a small percentage that believe in your products. The goal should be to make them happy enough to occasionally recommend the company by any means including social media. In this, you may broaden the message outwards. The issue is that most companies are happier spending on gaining new customers than satisfying existing customers. It has never made sense for brands to be "social". People don't want a social relationship with a brand. This does not means you should not be on social platforms but for consumers to more easily reach you and not for you to reach consumers. Thank you for this incredibly insightful post, Augie. And, thank you for being the voice of reason for those trying to make social media something that it was never intended to be. I couldn't agree more that "social media is a relationship medium, not a direct marketing channel." Well said, Augie. Well said. Good to see that you are still leading the way Augie. I figured this post would get some reaction, and I'm pleased to see the carefully considered challenges (and praise) here and on Twitter. Terry, Tom, Michael, Hal and John, thanks for the support. It comes as no surprise that I'd find myself on the same page with folks like you ! Augie Ray﻿ go bold or go home! Since you are hinting that I and many others social marketers examine our career path, I thought to add a few important issues to consider with your article before you send us all into an existential and career crisis. In person and online surveys like those referred to in the article chart consumer opinions, which are often riddled with attribution errors and actor-observer bias. A Nielsen's report down playing the importance of Social is near useless considering their relationship with the search giant Google and correct me if I am wrong, but I am pretty sure that Pitney Bowes still thinks the Postal industry is a good long term play. Though I agree with many of your premises and most of your wrap up, the fact of the matter is social, specifically Facebook is one of the most accurate data resources in existence for companies to generate business opportunities today, it just so happens that most marketers are not well versed in sustainable growth practices, performance ad targeting, and social graph hacking for ROI. Next drink is on me and bravo for stirring the pot. "The key to success is not to assume that social media is a marketing channel but to assume it isn't." IMO That's long been one of the most critical flaws in all business communications Augie, that channel conduit metaphor. It's that assumption that if you send it down the pipeline: "they" - whatever audience you're targeting - will receive it; they will pay attention to it; they will understand it; they will come and do whatever action (buy, vote, like) you need them to do. Flipping those assumptions around, taking a new look - that's the smart way to move forward as the social landscape continues to evolve, transform, as the way we do business does. FWIW. Bunk, Augie. Correlating SM performance one-to-one w/ stock price is, as Freud said of mental illness, over-determined by multitude of moving factors, of which SM is one tiny factor. Bravo for pointing out how to do SM right, or better, but i don't think that changes the issue. SM won't return ROI But it "works" when it's a well-integrated part of a large & well-conceived overall digital portfolio: well-designed Web sites, strategically-successful PPC, mobility that works, a smart DNS strategy, and much else. So, I think while much research you have gathered here is to the point in itself, it's to the wrong point. It's irrelevant to the real point of achieving digital ROI. Christopher, I agree with you that we must be aware of the source of data (and that was EXACTLY the point of my last blog post). That being said, most of the positive studies on social are done by agencies and vendors that have a stake in the game, and most of the negative studies I cited are from far more trustworthy sources with more objective intent. Marketers have been too quick to buy into any case study or study by a company eager to sell social media services while turning a deaf ear to the growing body of evidence that has shown disappointing outcomes, struggling social media programs, poor sales, lower organic reach and annoyed consumers. I stand by my contention based on my considerable experience and the data. Social is an important thing happening TO companies, but it is a weak channel FOR companies' social media marketing communications. It seems marketers never learn. But just as we saw with the Internet, I think other parts of the company are on their way to exploiting social for other sorts of benefits. Eventually, of course, some marketing will be part of a brand's social strategies, but I continue to believe that the way marketers today own and run social profiles is the wrong governance and structure for corporate social media. Besides, I didn't say that social wasn't an important part of companies' digital or business portfolio. You know me, and you are aware I think social is an important change happening to companies and a vital part of business strategy. What I said, in essence, is that social is a lousy marketing strategy. I agree with you that social integrated into digital and business strategies provides value, but the way companies are treating their social profiles, marketing content and fans/followers today is simply mistaken and failing. I'm happy to admit where I'm wrong, but if you want to prove me wrong, it will take some objective, third-party data that contradicts the many data points I cite. Case studies do not count (since there certainly are some rare companies making social marketing work); you need to cite reliable data that demonstrates consumers see social content with significant reach, they respond to social content in ways that are measurable and scaleable and that the sorts of results marketers value can be reliable produced and reproduced by brands via social media marketing. I'm laying down the gauntlet to you to do the same amount of research I did to find objective, trustworthy studies and research that demonstrates my post is, as you say, "bunk." Thanks for a thoughtful and well-researched post. I think you've reported great news! That is, as recommended in your conclusions, that if 'social media marketers' wish to keep their jobs, they better start earning their keep. And there are ways to do that which are based on established marketing concepts. There is nothing new under the sun, and if social media marketers had long ago established social as a complementary aspect of traditional marketing, they might not have found themselves in such a bind where they must back-track to justify their existence. 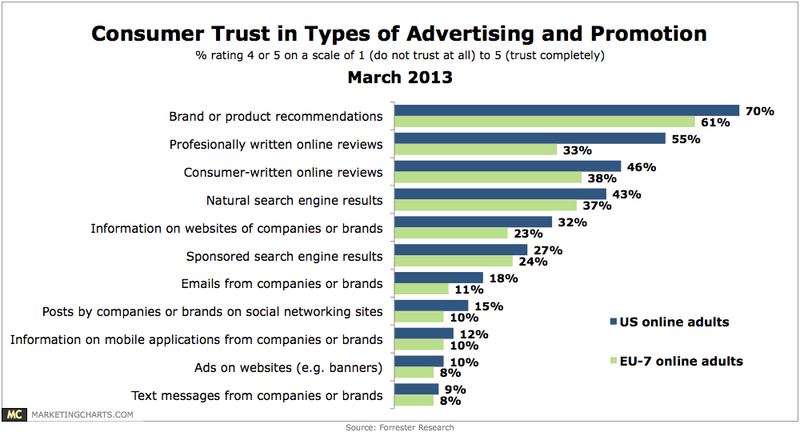 All marketing is founded upon trust. Talk about earned media... Marketers, remember this glaring point - it's not about you. Nor do I believe that the positive and more likely successful tactics you outlined are false or at least logically refutable. (And thanks for outlining these better practices, as opposed to the thousands of articles published daily on "Your 5 Biggest Social Media Mistakes" or "Why You're Doing Everything Wrong on Social Media," which then offer only vague hints of what you could be doing or how real intelligence just might really work for you. But here, below, is where my second reference to "Bunk" was meant to land. You certainly seem to be at least IMPLYING that if companies were to follow your suggested list of better practices that SM will work for them and, work in a very specific way, namely, landing the Holy Grail of ROI. That at least is how I read your better practices section. However, I think it's very unlikely that more than a minuscule number of companies could ever achieve positive ROI no matter how damn good their SM practices are, if looked at as a singuler marketing program. I will repeat that successful SM can be judged only by how well integrated it is with a company's myriad of digital properties and practices. This, to me, is largely a question of how those myriad digital properties and practices are ORGANIZED and, as you seem to agree in your reply, very few companies are in fact organized in such a way to enable a CONCERTED digital strategy and effectively integrate their digital activities. I hope this explains better my "Bunk" comment and your perhaps accelerated aversion to it. Ken, Thanks for the clarification. I'm pleased we agree more than we disagree, but I have to say there are times I think you enjoy being a gadfly. Your conclusion, that I seem to IMPLY a correlation between social activities and ROI is the exact opposite point I was making (in more than one place.) My blog post contends that ROI is the wrong metric, and in several places I imply that unless marketers are willing to accept long-term metrics, that have a misalignment between their objectives and their strategies. I appreciate your comment, but I am puzzled why you would feel I am implying the specific opposite of what I stated. I think you enjoy sparking debate and disagreeing, which I happen to enjoy, but in this case I think you may have misfired. As for if I am merely restating things that have been said, you are correct, I am. But I could say the same thing about your posts, as well. More to the point, the number of retweets of this post (here and on Social Media Today) seems to indicate a lot of people think this needs to be said and shared. We should both keep up making the same point again and again until more marketers get the message! Juan, Thanks for the comment. Mark, I love that you said "there is nothing new under the sun." I say the same thing--a lot. In the end, the message of this post is not that social media marketing cannot work but that it does not work in any way different than other marketing in the past. Marketers expected something different from the social era, but it's the same old WOM as ever. Do right by the customer, offer great products and services, provide a great experience and you are more than halfway to marketing success. But, try to out-market the competition with catchier advertising and snappier taglines, and you're halfway to failure! So why keep looking for one-to-one correlation between SM-favorites and stock market performance? I’ve twice now — thrice if you count this latest exchange — pointed out this “erroneous linkage” and you’ve yet to either refuse to defend it or admit the fallacy. There are lots of Facts and Conclusion that are “true,” but not when they are led to by faulty reasoning. So let me throw down the gauntlet on this one: Show me why it is reasonable to assume that one tiny part of a company's multifarious activities can strictly and on a one-to-one basis correlate with that company's stock market performance. Had to break this into two parts: too many words. Since ROI, however, is what virtually ever SM manager is seemingly focused on, willingly or not, I (erroneously) took that as implying ROI. Since that was not your intent, again, Mea Culpa, my apology. Do I like to spark debate? Damn right I do — as I know you do, too, although it seems lately you're much happier w/ overwhelming agreement than what even I would concede is, in the context of your whole post, some nitpicking about a few points. My fundamental training has been in philosophy, where “argument” is not a dirty word, as it largely is in corporate America, but is rather seen as the key to eventually arriving at truth. So, yeah, it bothers me when a lot of reasonable arguments can be made to seem unassailable by a chorus of huzzahs! Twitter-favorite companies’ market performance “was no better than the NASDAQ index and their median performance was significantly below the NASDAQ index.” I don’t doubt those facts, just their relevance (or rather note their irrelevance), because the procedure to arrive at them relied on erroneous linkage. And, oh, yeah, another point you elided, why are studies by IBM, Adobe, Kentico, PwC — all of which are in the business of helping marketers get their SM efforts “right” with proprietary products and services — inherently more reliable than agency Case Studies? Do you really believe there's less venality in the former than the latter? Very thoughtful and thought-provoking post, Augie. To me, your most succinct statement is "Social media is not a marketing channel." I say this to my clients every day. If you see social as merely a marketing channel, I think you leave most of its value on the table. Social media is social. It's about relationships, it's about trust, it's about leadership. It's about building networks of value and word of mouth communication. Every business creates a community and is supported by a community. Social technology is a medium through which a community communicates, shares and engages – in other words, social tech gives existence to these communities! I tend to agree that the correlation between any one micro-tactic and a macro measure such as profitability, stock price, etc. is misleading – whether the correlation is positive or negative. And, I've always been uncomfortable with the hijacking of social media for marketing purposes. If anything, my takeaway from this post is the importance of understanding how social is changing interpersonal communications and communities and how these changes can be leveraged in any given business context. Nice work, Augie. Few people like a company that uses social connections to market itself. You know that in your gut and you've demonstrated the metrics to reinforce that.